I'll confess first: I did NOT see the Deen brothers at the 2013 Incredible Food Show in Lexington. Even though the Show always offers exciting celebrity chef presenters, and even though I heard particularly good things about this year's guys, it's the homegrown flavors at IFS that always get my attention. Those Kentucky flavors are growing stronger at this big food show. This fifth IFS settled more deeply into showcasing real Kentucky. 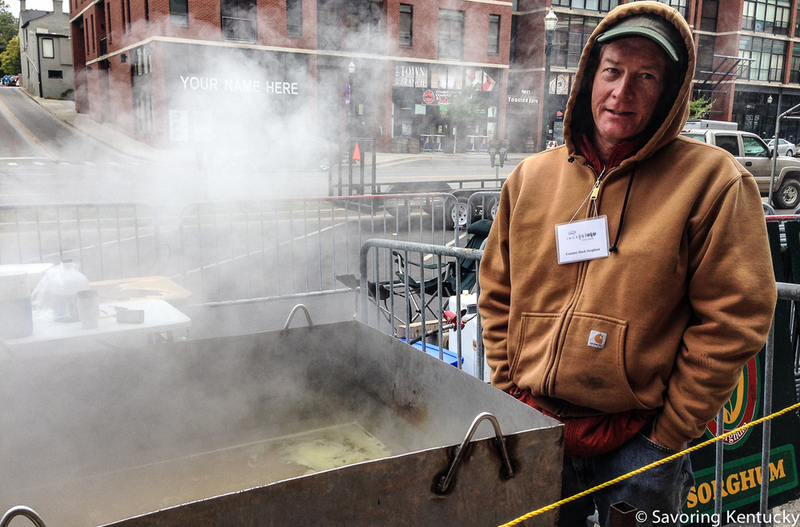 In spite of chilly weather, the Traditional Food Craft area outside the Lexington Convention Center materialized again, right along Lexington's Main Street, and may even have been a bit larger than last year, which was the first time this feature appeared as part of the show. That's Curtis Congleton of Woodford County's Country Rock Sorghum above, sending eau de sorghum cane juice all over west Lexington. Just inside the Convention Center, Country Rock sold sorghum and their own Kentucky maple syrup to eager crowds. The word on sorghum is getting around. I appreciated, too, that one of the main sponsor tables I encountered first at the main entrance to this year's show featured the new, large scale Kentucky-based dairy initiative,: Udderly Kentucky, with its 100 percent Kentucky Proud milk. That milk would pair nicely with some of the splendid pastries from the Midway School Bakery booth, where Chef Carrie Warmbier blossomed along with the flowers and treats. From Pikeville to Paducah, literally, coffee roasters are opening cafés and shops in Kentucky towns, bringing the world's flavors to our handmade Kentucky pottery mugs. Pikeville's brand new Shuffle Bean Coffee offers locally roasted beans from one Costa Rican coffee hacienda—medium roast, smooth, delicious. Shuffle Bean is so new I can't even find an online presence except for their trademark application. Paducah's youthful Righteous Roast Coffee also made the long trek to Lexington to share their scrumptious Ethiopian and other beans. Righteous Roast just gained two important certifications: Kentucky Proud, and Fair Trade USA. New at IFS, I think: quite a few producers of fine, Kentucky-grown, Kentucky Proud foods, including Crigger Farm (Warsaw), which produces local honey, and honey-based products like honey spiced apple butter and honey bourbon balls. These first-timers at IFS won the judges' taste buds and received the Best Sweets award. Cedar Creek Vineyards (Pulaski County) also tried out IFS as a showcase for their growing collection of wines. Two other Kentucky Proud personal favorites showed up and pleased a few thousand people: Four Hills Farm (Mercer County), offering samples of their delicious Katahdin lamb, which, I'm thrilled to learn, is now available fresh at Good Foods Market in Lexington. Taylor Hollow Snack Foods (Scott County) brought their crunchy baked A-Maize-Ing Caramel Corn and some savory options that I advise you never to try if you want to avoid one more food addiction. As these producers filled a wholesale order, I learned that they are a Kentucky Proud business. Their corn grows on 4,000 Kentucky acres, and a portion of the flavoring for the cheese-y corn varieties comes from Kentucky milk. 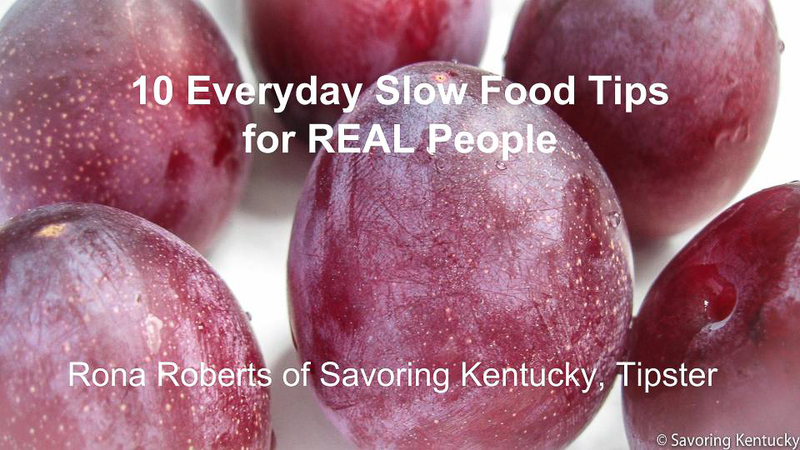 Of course many treasured pillars of Kentucky's local food system came and did their polished, practiced work brilliantly, as they have done in other years. Barbara Napier of Snug Hollow Farm Bed & Breakfast (Estill County) gave away the secret for the B&B's memorable biscuits—again—and people lined up 10 deep to watch and taste. Browning's Country Ham (Dry Ridge) gave away bites and sold their delicious smoked and cured meats. Ed Puterbaugh, sporting a cheese top hat, offered tastes of Boone Creek Creamery's wide range of Lexington-made cheeses. Good Foods Market set up a busy corner micro-store, featuring, among other goodies, my favorite Castelveltrano olives, also called Nocelllara del Belice. More than a hundred producers filled the Marketplace. It was busy, smelled good, and looked appetizing all day long. Edible Louisville & The Bluegrass Region folded me into their morning presentation on Slow Food, and invited me to their booth afterward to sign Sweet, Sweet Sorghum: Kentucky's Golden Wonder. I enjoyed how eagerly people accepted the free editions of Edible that we handed out at the booth. Midway School Bakery and Good Foods Market sponsor Savoring Kentucky.